As Hawthorn premiership defender Grant Birchall and Melbourne captain Nathan Jones shake hands before the pre-game coin toss, participating in awe is 19-year-old Isabel Fitzgerald. From her vantage point in the centre of the MCG, arguably Australia’s grandest sports stadium, Isabel hears the heads-tails verdict and which end the team of the winner will kick first. This is a small aspect of the Fiona McBurney Match Day Experience – an initiative of the AFLUA and AFL where individuals with Down syndrome and their families enjoy a unique day at the football. In season 2015 across 18 AFL games, 18 individuals with Down syndrome will be an Umpires Trainer Assistant as part of the Fiona McBurney Match Day Experience, named in honour of the late sister of former umpire Stephen McBurney who had Down syndrome. The experience highlights the abilities of individuals with Down syndrome and aims to raise awareness of the value social inclusion within the broader community has on the development and lifestyle of individuals with Down syndrome. From arrival at the ground to departure, the AFLUA has implemented an engaging program embraced by the entire fraternity. 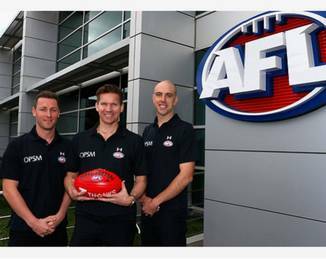 Umpire Chris Donlon wears number 1 and he has been the driving force behind the introduction of the Fiona McBurney Match Day Experience, but its success has been a result of the first class efforts of every member of the AFL family. Outside the ground the participating family – for Round 7 it is the Fitzgerald family – is greeted by a volunteer chaperone, who for the remainder of the day ensures the family of the participant have a memorable experience too. Upon entry into the Umpires Room in the bowels of the MCG, Isabel and parents Bryan and Gretchen, are warmly welcomed into the fold. Every umpire, trainer and advisor makes a beeline for Isabel and the family. Not one is a token handshake – each person genuinely engages in conversation with the Fitzgeralds. During the pre-game huddle, veteran umpires trainer Ted receives plenty of ribbing about his years of service. However, his experience is one of theprofessional aspects of the Experience. Ted will shadow Isabel for the remainder of the Experience and teach her what the role entails. In the huddle, Isabel was presented with an official AFL tracksuit uniform – she is one of the team. In the days following Isabel will proudly wear that tracksuit at home and only remove when required for sleep. As the umpires strode onto the MCG holding the ball aloft, proud parents watched Isabel carrying water bottles as a member of the Umpiring Team. For the fans in the stand, the newest member of the umpiring team is listed in the Football Record. After the game Isabel said she now understood there were more than two teams involved in a game of football and she enjoyed being part of the `quiet team’. From centre wing, Isabel waved to mum and dad. For the duration of the game, Isabel watched the action from the comfort of the umpires’ race. At each quarter break, whether on the ground or in the rooms, Isabel was on hand with refreshing water, goodies in her bumbag and other items the umpiring team needed. Along with memories and experiences many people can only dream of, Isabel would be permitted to pick some MCG grass to take home in a Ziploc bag as well as a signed match day ball. With the match being a Hawthorn home game, even this author was envious of being able to own a Hawthorn match day ball. In consultation with AFL photographers, the participating umpires would also present Isabel with photos of this experience. On twitter (@sport_ability) an image of Isabel shaking hands with Jones captures the joy of this experience for all participants. At the conclusion Isabel and her family bid farewell to the Umpiring team, providing space for the `quiet team’ to freshen up and perform official duties. Leaving the ground the smiles on the faces of Isabel and her parents broadcast to others the enjoyment of the Experience.